I had a great experience with Antlermeadow Labradors. Sarah could not have been more helpful. We got our chocolate lab Daisy from Buddy & Keeva's January 2018 litter. She is exactly what I was looking for. She is good looking, smart, has high retrieval desire and is a great companion. Sarah has continued to keep in contact to make sure things are going well which has been much appreciated. We consider ourselves so fortunate to have received our puppy, Ammo, from Antler Meadow in January 2017. From our very first contact right up to now, Sarah has been amazing to deal with. Ammo has far exceeded our hopes and expectations no only in his bird hunting abilities but also his personality. He is very intelligent, strong and driven and has been SO EASY to train. Sarah did so much work with him and spend countless hours going above and beyond to make sure we received an amazing dog. I will only be dealing with Antler Meadow for future puppies. I can not recommend Sarah enough. Sarah and Antler Meadows is one of the best experiences you could ever have when adding your new family member. Our boy Fynn came from Keeva & Chester's litter Nov 9/16 and has been the best addition to our Family. He's handsome, strong and oh so smart (he makes us look good as parents lol). Fynn has taken after his Dad (Chester) in dock diving, he's a natural at it with the many ribbons he wins. We couldn't be happier with our special boy! But it all started with Sarah - from the care and attention she gives to each of her puppies before they come home - the wonderful pictures she posts and the tons of information you receive. We have people asking us all the time where Fynn comes from as they haven't seen a better looking lab and we tell them with much pride of Antler Meadows and they couldn't ask for a better breeder - thanks again Sarah for all you do!!! We just wanted to re-iterate our exceptional and wonderful experience with Antler Meadows. Our Joey, just turned seven and is a pup from Hershey and Bender's litter from April 12, 2010. As I reminisced looking through the extensive information binder that Sarah provided about Hershey, Bender and Joey, it is a testament to how kind, smart, loyal and incredibly lovable dog we could have ever asked for. He is such a critical part of our family dynamic. We talk to him like he can communicate and people constantly praise him for his obedience and genetics. Our neighbours are also so grateful for Joey. When Joey is outside he rarely voices his opinion but when he barks they pay attention and come looking. Although Joey is only seven and extremely social with other humans and dogs, (actually if we have a ball nothing else exists) I am always looking at the new pups. We continually refer people to Antler meadows and always will. Exceptional breeder, Sarah sets the bar! My experience with Antler Meadows has been nothing but positive. Sarah was always very helpful and accommodating with my questions and sending updates on the puppies after they were born. After I took my pup home, she continued to provide support and sent me home with a great package like nothing I have seen from another breeder. My boy, Matteo, is almost 5 now (Hershey and Bender's Nov 2011 litter) and is just the best dog. I am still constantly getting stopped and told how handsome and good looking he is, and what a great easy going personality he has. He was so smart from the get go, and so easy to train with a sweet, easy going personality. He's truly a great lab and a great dog. I couldn't be happier with my choice of breeder. I found Sarah almost a year before taking Kona home and throughout the process she answered all my questions, let me visit and meet the other dogs and Mocha, and was great in helping me choose the perfect pup for me. Kona is now 2 years old and she is the best! She is very smart and has the friendliest temperament. It can be difficult waiting for your pup; however, the weekly updates and pictures definitely help the process. Sarah is great with communicating through every stage, I even saw a sonogram of the puppies! When you take your puppy home, you get a booklet filled with information about your pup and his/her parents. If you are looking for a lab, I highly recommend Sarah and Antlermeadows. Sarah is so knowledgeable and loves her dogs, before the dogs come home with you, they are getting the best care with Sarah. If you are looking to add a healthy beautiful pure bred chocolate lab to your family, look no further than Antlermeadow Labs. We started our journey for the perfect chocolate lab breeder in January of 2015 and after researching many breeders we were very happy to choose Antlermeadow Labradors. From the very beginning Sarah was very helpful and answered all of our questions as we were also first time dog owners. When our pup's litter was born Sarah kept us up to date with weekly pictures and the pup's progress. The dogs are all certified and in fantastic health! Tugg is now 9 months old and has passed his prerequisite hunting course through Ringneck Kennels with flying colours. He is incredibly smart and has a heart and temperment of pure gold. 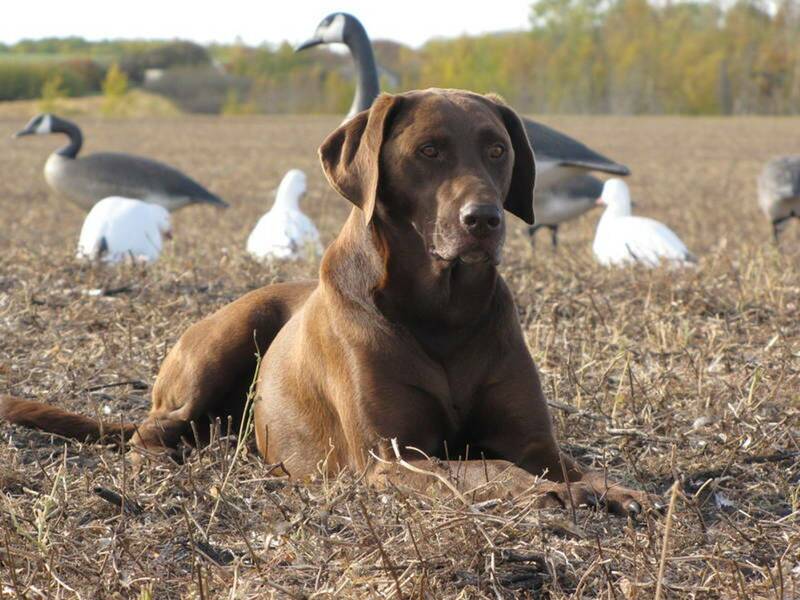 Whether you are looking for a hunting companion or a furry addition to your household, Sarah and Antlermeadow Labs will be able to deliver the perfect lab to you! Thank you Sarah for everything that you have done for Tugg and ourselves!! Antlermeadow Laboradors is an outstanding breeder for anyone looking for the perfect dog. From the onset of our search, Sarah was extremely helpful and quickly earned our trust in determining Antlermeadow as our breeder of choice. Throughout, Sarah has provided excellent information and advice to us as first time dog owners. Once our puppy was born, we received weekly updates, photos and videos highlighting the progress of the litter. She was very knowledgeable on the characteristics of each puppy which assisted greatly in determining the puppy that would be the best fit for us. When we brought Cliff home, Sarah remained in contact with us and has been very responsive to the numerous questions we had regarding our fur- monster. Cliff is an absolutely amazing dog who is smart, healthy and extremely friendly. He is well mannered and a fast learning dog which has made it easy on us as first time owners. We hope to add a second dog to our growing family in the near future and Antlermeadow Labradors will, without question, be our first choice of breeder! We would highly recommend Sarah as a breeder. She was good enough to send weekly pictures of the pups after they were born. Coco came home with a very helpful and complete information package that impressed our vet. Coco has made an amazing transition into our home and she is smart, healthy and beautiful. We're very happy with our choice of Antlermeadow Labs. I would not hesitate to recommend Sarah and her labs if you are looking for a beautiful, healthy, well-bred lab. When we started our search for our newest family member, we were confident in going through Antler Meadows. Our family had purchased their lab, Ruger, from Sarah 3 years before, and you couldn't ask for a more attractive lab. From the moment we were in contact with Sarah we were comfortable and reassured that she would be our breeder. She is very knowledgable and provided us with answers to any questions we had. From the moment Lily was bred, she kept us updated on her health and progress. When the puppies were born, we looked forward to the weekly email and pictures. We constantly knew how the puppies were doing. Sarah has a true passion for what she does, and absolutely loves dogs. We will not hesitate to purchase our next lab from her. Thanks for everything you do Sarah!